There's some cracking players in here. EA Sports continue to spoil us with some wonderful in-form items each week, and this bunch of players certainly continues that trend. 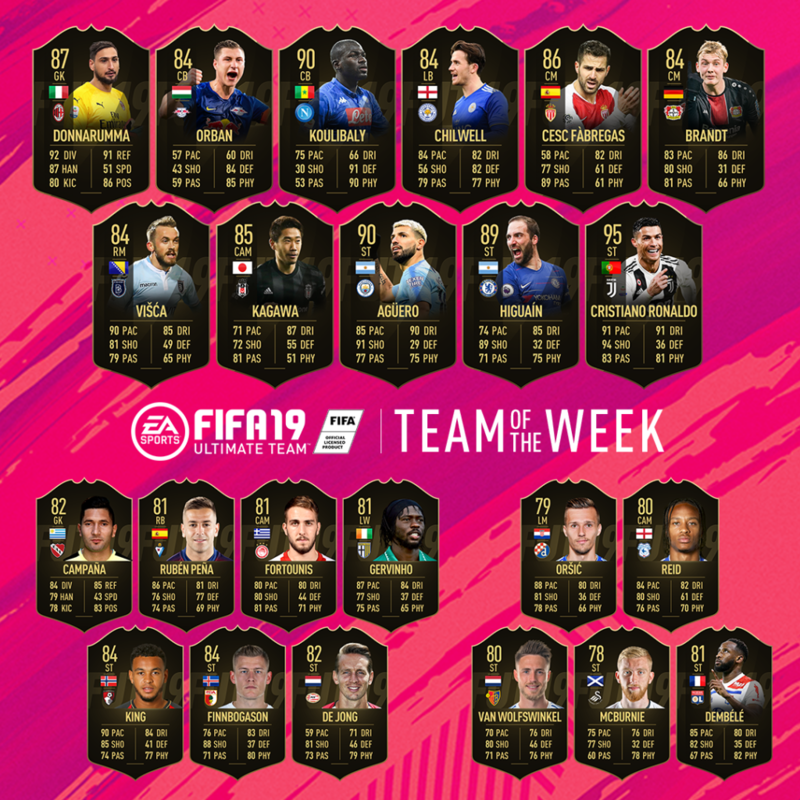 FIFA 19 TOTW 21 has been announced, with some big names on show. The first name that will jump out at you from this side is of course Cristiano Ronaldo, who has been rewarded for his brace against Parma at the weekend. His 95-rated striker item will cost you an absolute fortune, but is all but guaranteed to get you buckets of goals up front. Sergio Aguero's in-form is also amazing, with his mix of pace, finishing and dribbling sure to be an absolute nightmare for opposing defenders. Gonzalo Higauin has also be rewarded for his first Premier League goals, and his move to the English top flight will no doubt make him a very popular player over the coming weeks. Other Premier League stars who feature include Ben Chilwell and Joshua King. The lack of quality left backs in FIFA 19 will no doubt make Chilwell a fixture in many Ultimate Teams, while King's pace and shooting should also get him plenty of game time. Elsewhere, Kalidou Koulibaly's 90-rated effort looks like an absolute monster. His defensive chops and physicality will make it almost impossible for opposing attackers to go by him, and he is certainly one of the top defensive players in the game. Cesc Fabregas' instant impact at Monaco has also not gone unnoticed, and he has also earned his first in-from card of FIFA 19. TOTW 21 will be available in packs from 6th February at 18:00 GMT until 18:00 GMT on Feb 13.